In the Lower Jurassic period from south Africa..the large prosauropod Aardonyx is attacked from the theropod Dracovenator. 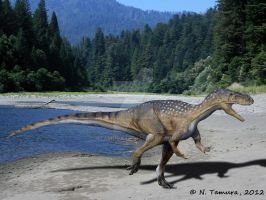 The Dracovenatorreconstruction is based of very little Bonefragments and speculativ. Dracovenator like the Dilophosaurus ? oder like Cryolophosaurus? in my Pic , DV is an species like Dilophosaurus.